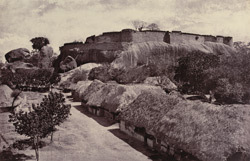 Photograph of the Hill Fort at Tirumayam from the 'Photographic Views of Poodoocottah' (Madras, 1858) collection, taken by Linnaeus Tripe in 1858. Tirumayam is located near Pudukkottai in Tamil Nadu. On top of the hill near the town is a fort that dates to 1687 and was built by King Sethupathi of Ramanathapuram. In the crevices that surround the hill-top fort are two rock cut cave temples which lie side by side and are dedicated to Shiva and Vishnu, both built by Pallava kings. This view looks from the top of the gateway of the outer wall of the fort with the thatched huts of the village in the foreground.